The following are letters from John Evan Flinn to his family just before and during WWI. 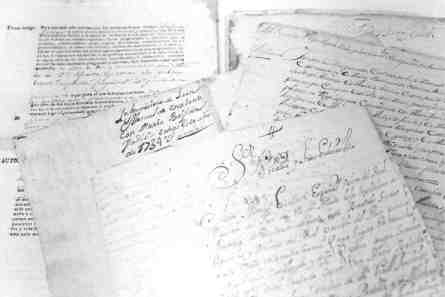 The originals (or photocopies) of the letters were in the files of John H. Flinn. I am transcribing as close as possible to the original as well as trying to keep the letters in order. All of the "War" letters had the censors signature on them. Where I am unable to read the writing I so note with parenthesis and/or a question mark. Dear aunt, Got here alright, on Thurs. morn. Found everyone well with the exception of papa. He is not very well. I sure had a headache when I got here. And an awful bad cold. Have got over it yet. Has your tooth come through yet. I guess longoody & Ella are hopping high by now. I sure feel sorry for you, I know how it is ha! Ha!. How is Alvia and the rest getting along. I guess he and B. will have a time one their motor. This sure looks torn up around here. I guess will get about one bale of cotton or more, off 15 acres. Say if I have any mail to come there send it to Taft. Please. PS, Please excuse this paper its the last there is on the place and I forgot to get any yesterday. nice little rain yesterday. It sure put new faces on people to. I had begun to think we was going to have another drouth. But things look a lot better new. I sure hope we will make a good crop another year. We sure need it. Mat told about you writing that Witted was to move. I guess you all are glad. Of course those that move in may not be any better. How is Uncle Will his getting along. Tell them hello for me. I told them I would write to them but I have just kept fooling around & have not wrote any one. You know how bad I hate to write, and I cant write either. But I will try to scribble them a few lines later. Has your bermuda come up yet. I hope it has. Dear Ma, How are you all. I got there 2 weeks ago, but like to froze to death on the way. When I got here there was ice sleet and snow all over everything. Stayed that way for 3 or 4 days. Believe me it was some cold to. Did it get much colder after I left down there. Did you all get much rain. There is fine season in the ground around here. Most everybody has some plowing to do. I was sick most all last week & could work. But I am better now though I have still got a bad cold. There is a good deal of work going on around here now. I have been helping build grandpa a barn. Where is Hall (Hal?) and Tom now and What are they doing. I guess they got through on the causeway didnt they. Has Pete ever bought him a suit yet If he hasnt I can get him a good suit here for the money. If he hasnt enough I can put some with it. How is old Nell looking. Does Pete feed her good. Is Pa well now. I dont guess any of the kids taken the measles did they. Tell Gladys to write me a long letter. There is a good deal of sickness around here. Measles and so forth. I guess you all heard about Ollie Hoyle dying. They burried him Sat. evening here at the Presb. Cemetary. Will close with love to all. P.S. Tell Tom Malone about Ollie dying. Post card  "The Marines have landed and have the situation well in hand." This is a printed post card from the U.S. Marine Corps Recruiting Station, Waco, TX. The words in italics are in Johns writing. I have successfully passed the examination and been accepted for enlistment in the UNITED STATES MARINE CORPS, and am leaving for Port Royal, South Carolina, where I expect to be stationed for the next three months. Address me at "Marine Barracks, Port Royal, South Carolina." Dear Aunt: Just recd yours and Grandmothers letters. Was sure glad to hear from you & her. I am glad I can truthfully say that I am not what you called O. Mott. That is his calliber and I sure would like to be there and tell him what he really needs to be told. I think I could make him crawl in a hole and pull the hole after him. There are many more of his kind. But "I should worry." Someday they will get theirs, and someone else will have the laugh. My! I do wish I was there to sit by the fire with you all. Those were the days. But I expect it will be quite a while before they return to me. I expect you can enjoy yourself with Mrs. Frederickson as a neighbor. She is lively enough to keep you all from getting lonesome. Does Henry K. still live there. Ha!Ha! Do you remember the first time we made them a visit. I know I never will forget that night. Some time we had " singing." Ill bet John is still laughing about it. Well I have wrote all I can think of at present. Closing with love and best wishes to all kin and Friends. Dear Mother; I just recd. the xmas box you sent me. Words cannot express my appreciation of the remembrance. It arrived safe and sound. The cake sure did keep fine, and I was more that glad to get some American candy. I gave some of the fellows Slices of the cake, and they said it sure was fine. I also recd. a carton of smoking tobacco from Hal. They were the first Packages I have recd. since I have been over here. I never recd. anything from Aunt Sally Rogan. Have you Heard from her lately. I wrote her a letter a while back. I often wonder what everyone in the states think of what war is. They are too far away to know really what is means. We should not worry about such things though, because it only makes things worse for all. I can say one thing I am well and have been all along. That is something to be thankfull for. I have the consolation that I am one out of many that can say that. How is dad getting along now. Does the Rheumatism bother him much now. Tell him to take care of himself and dont expose himself too much. Well I must close, sending love & best wishes to all. Mrs. J. W. Flinn-Finn Family Dear Mother, I recd. your letters and was sure glad to hear from you. I sure hated to hear about Emett being sick and also Gladys. I sure hope they are well by now. I would loved to have been there with them. Dont ever fail to let me know when any of you are sick. I always like to know how everyone is. Even if they get low, dont fail to write. For I would rather know it at the time than to be held in ignorance and have to learn it later. I am prepared to hear anything now and always keep me posted. I had a letter from Harris Mears. He sent me two pictures of him & Uncle Charlie. I also received your Christmas present, the Kaki bag & the wristlets from Dad. I recd some smoking from Hal. I have not seen him & dont think I will have another chance soon. I would write all the rest but I dont know enough to write one letter. So I must close. American Marines Club At the Front (France) Father Brady U.S.N. Dear Mother, As this is Mothers day I will drop you a few lines. It is something to be proud of, to have a mother to wrtie to There are just lots of the boys that have no mothers to write to. I consider myself one of the lucky ones. Every man of the American E. F. is supposed to send his mother a letter to-day. I wrote you a letter a few days ago. I have recd. three letters from you since I wrote. Two of them were written in March. The other in April. I am sending you a few flowers picked in "France." I was sure glad to hear that Emmett was well and back in school. I hope the little fellow keeps up with his grade. I would sure hate to see him put back. I must close hoping you will see many anniversarys of this day. Give my love to all. Your Son John E. Flinn. I recd. a letter from Dad the other day. Dear Mother: Just recd. your most welcome letter. Yes I recd all the pictures you sent me. When I look at them I can just that little old (?) Emmett on his way to school. A man cant spend much time at present thinking about such things. If he did he would sure enough get downhearted. To be without worries a fellow should never think of home. I am always doing something to keep my mind off such things. I recd a letter from Dad just a day before I got yours. I see you did not say anything about Tom F. in your last letter. That "Guy" is as "yellow" as they make them. He is certainly some slacker. I would just glory in having a chance to tell him as much or more. I believe I am man enough to make him like it to. I have no earthly use for him, whatever, since finding him out. I did think at one time that there was at least a spark of manhood about him, but I have changed my mind entirely. I have no use for such animals. Say have Bess tell Clara C. that she may have a chance to be "B.M." some day, for V.H. Dont tease her too much. I laugh many times at that kid. Must close with love to all. J.E.F. Dear mother; please excuse me for not writing sooner than I did. Hal is here now. I was glad to see him too. He did not get a transfer in the Marine Corps. It made me feel like I was at home, to see him. Tell Lois he is looking as good as ever. We are both enjoying the best of health. I am driving mules. We are not supposed to tell anything, so dont let it get out of the family. Hal brought me some tobacco & cigarettes. Believe me I sure was glad to get it to. I recd a letter from Luther & May today and also your letter. I dont know any news to write. But I always like to hear from you all as often as you can write for it makes me feel better and helps to keep the blues away. I wonder how all the folks are at Georgetown. I must close and go to bed as it is getting late. Tell Sam H. that I dont want to sell Nell at all. I may need her someday. Tell Hardy Hello & tell him to write me the news around his place. I have the same old address. Tell the boys to write again for I love to hear from all of them. Dont let dad work himself to death. Dear Aunt, It has been several weeks since I have written you. But I havent had many chances to write any one. I suppose you have read about "U.S.Marines" during June. I cant write you any thing but I am still alive and well. Is Harris still living. I never do hear from him. He is sure funny about writing. Tell him if he dont write I will treat him worse than a "Hiene" when I see him again. I had a letter from Viola a few days ago. She sure seems to be patriotic. What does Grandad think about the war by this time. Ill bet he has changed his mind about lots of things hasnt he. Did you ever send that picture to Uncle Will & the rest. It was sure a (grim?) picture to enlarge. I had some better ones, but lost every one of them. Say will you send me Aunt Eulas address. I want to write her, but dont know how to address her. Send me all their addresses so I can write when I have time, I want to write a bunch of letters when I can. Is grandmother ever sick much. I hope she is well and keeps so. Tell her I said for her to take good care of herself. I often think of her chasing around and not being careful about her health. I hate to think of it, but I am too far away to help you prevent her from being out in bad weather and exposing herself to such. Dear Aunt, Please Pardon me for not writing sooner. I have so many to write to that it takes a long time to get all the way around. Never the less I always appreciate yours and Grandmothers letters. I recd. a letter from Aunt Eula while she was at your house. I sure would loved to have been there. It reminds me of old times. I hope to be there again some of these days and we will all have a reunion again. Oh, say I was sure glad to hear that Foster L. enlisted in the "Marine Corps". I hope to see him some day, while we are both in the Same service. If you have his address I would like to get it, so I could write him. Aunt Eula said Grandmother looked better than she did two years ago. I am sure glad to hear it, and I hope she continues in good health. Tell her to take good care of herself and tell Grandad the same. Dear Sister, I havent written you a letter in quite a while. I have to write when ever I can and sometimes I cant write for a good while. I always write Mother so I make it do for the whole family. What are your doing this summer. Do you ever go to Portland. Gee! I would sure love to be there and go swimming. Have they had the band down at the pavillion this summer. Oh! For the 4th of July times again. Say, Mother never has said anything about where you were going to school next session. I dont suppose you will go to Sinton, will you. And Taft is no good. Is Mattie Lou still in Houston. Tell her I wish her good Luck. I had a letter from Clara not long ago. I sure wish you could see it. I never laughed so much in all my life. She is a fool or she thinks I am, I dont knowbut she is right. I answerred it just for the fun of it. She gives me lots of amusements. I must close. Give my love to all & tell every one Hello! For me. You bud, John E. Flinn. John E. Flinn was killed in action in France during WWI and is buried in the Taft Cemetery next to his parents. The American Legion Post No. 419 in Taft, Texas was named for him on Tuesday, March 22, 1927 at its organization. "It was unanimously voted that this post be named John E. Flinn Post No. 419, in honor of the only Taft boy who lost his life in France." When his body was returned to Taft for burial, as the story goes, John Evans father John William Flinn insisted that the undertaker open the coffin so that he could see with his own eyes that it was his son. Finally the undertaker complied and J.W. acknowledged that he recognized his son from the shape of his jaw. Copyright © 1997 [Jack's Publication Enterprises]. All rights reserved.